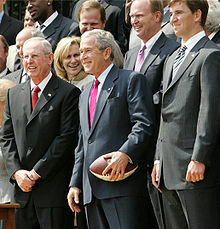 Manning and the Giants opened the 2008 season with a win over their division rivals, the Washington Redskins, 16–7. "It was a great opening to the season", said Manning, who completed 19 passes of 35 for 216 yards, and had one rushing touchdown and one interception. "There was a lot of emotion, a lot of excitement. You could feel it in the crowd." 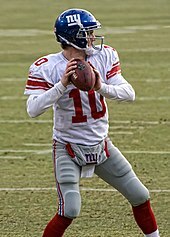 In the Giants' next game, against the St. Louis Rams, they won again, 41–13, behind a stellar Manning performance. 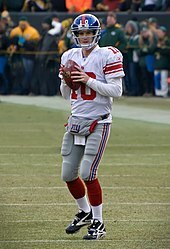 Manning finished the game with 20 completions, 260 yards passing and threw three touchdowns to three different receivers. 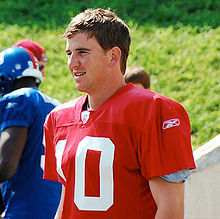 The victory also marked the team's fourth straight victory over the Rams. 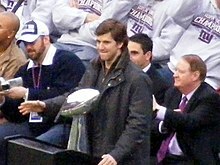 The following week, Manning rallied the Giants to more fourth quarter magic, overcoming a late deficit to throw the go-ahead touchdown pass to tight end Kevin Boss, and then in overtime, throwing a clutch 31-yard pass to Amani Toomer in the Giants' 26–23 win over Cincinnati Bengals. 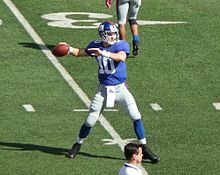 The fourth week of the season saw the Giants score on each of their first six possessions and dominate the Seattle Seahawks, 44–6. 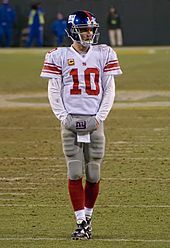 Manning threw for two touchdowns, completing 19 of 25 passes for 267 yards as the Giants totaled 523 yards on offense, their most since 2002.